In 2010, the PDA undertook a comprehensive strategic review of pharmacist roles and the potential impact their contribution could make on individual patient care and cost efficiency if their skills and accessibility were maximised within the healthcare system. This process took into account not only the views of the pharmacy profession, but also those of patients and the wider healthcare agenda. The concept of the individual pharmacist practitioner was developed and launched at the 2011 Annual Conference. This vision for pharmacy, called The PDA Road Map, encompassed the belief that through a realignment of primary care contracting, GPs could refer caseloads of patients with long term conditions to clinic pharmacists who would deliver detailed pharmaceutical care on an individual named and registered patient basis. In turn, this would provide GPs with more capacity to concentrate their efforts on the acute needs of patients to prevent unnecessary A&E attendances and hospital admissions. Having developed the concept of its ‘Road Map for Pharmacy’ the PDA embarked on an extensive lobbying exercise supported by a series of conferences, meetings and presentations throughout the UK to convince pharmacists, patient groups, politicians and other health professionals of its merits. The PDA’s Road Map for Scotland was formally submitted in 2012 to the Scottish Government review of pharmaceutical care in the community. In September 2013 the outcome of that review was published. Entitled ‘Prescription for Excellence‘ this ten-year vision for pharmacy in Scotland has the concept of the individual pharmacist practitioner embedded at its very core. In the summer, NHS England announced that the GP contract will be undergoing a fundamental review, and on September 30th the Deputy Chief Pharmacist announced that pharmacy is also to be reviewed, providing an opportunity to re-engineer a new contract for community pharmacy. To influence that process, on October 11th, the PDA’s Road Map for England was formally submitted to government. 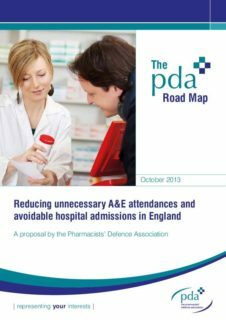 Developing the same concepts of the benefits of the individual pharmacist practitioner as it did in Scotland, the PDA’s Road Map for England focusses specifically upon reducing unnecessary A&E attendances and avoidable hospital admissions, which is a priority agenda in England. Alongside the on-going efforts in Scotland and England, the PDA also continues to engage in lobbying stakeholders in Wales, Northern Ireland and at EU level.